Give Back Yoga is honored to announce a partnership with Warriors for Healing, a new foundation created by former NBC News war correspondent Bhava Ram to bring the healing power of yoga to veterans nationwide. Bhava was on the front lines of conflicts in Afghanistan and Iraq, covered drug wars in South America, social upheaval in Central America, apartheid in Africa, and reported from several of the largest refugee crises of our times. A broken back and failed surgery ended his career. Confined to a body brace and unable to sit up to eat a meal, Bhava fell into the abyss of prescription medications, depression and PTSD. Then came stage four cancer from exposure to depleted uranium in the Gulf War and the prognosis that survival was impossible. Literally on the brink of death, Bhava embraced mind/body medicine and the deeper practices of Yoga and its sister science, Ayurveda. Through this process, slowly and often painfully, he healed himself physically and emotionally. He now devotes his life to helping others reclaim their inherent power of self-healing, find their authentic voices, and manifest their fullest potential. Watch Bhava’s story in a video from the Chopra Center’s Weekend Within. Now, Bhava has teamed with Yoga Journal LIVE! to create a premier event at the San Diego Conference this June to honor our veterans and to raise funds for Give Back Yoga. All who support this effort are invited to join us in selfless service by creating a Warriors for Healing fundraising team on Crowdrise, reaching out to family and friends for support, and helping grow the movement. To help us create a groundswell of support for this mission, we invite you to like the Warriors for Healing Facebook page and share your story of how yoga has helped you or benefitted a veteran that you know and love. Then, let your friends know — help us to spread the word and expand awareness of the healing powers of yoga, and the movement to give back to those who have given so much. Become a Warrior for Healing with Give Back Yoga! Learn how you can bring yoga to veterans through our crowdfunding campaign. All donors or teams who raise $250 or more will be reserved a mat space at the Warriors for Healing live event in San Diego in June 2015. If you can’t join us in person, you can choose to donate this space to a veterans’ scholarship fund, and share your energy by tuning in to a live stream of the event. For help in getting started with your fundraising team, email ann@warriorsforhealing.org. The Sedona Yoga Festival and the Give Back Yoga Foundation (GBYF) are proud to present “SYF Gives Back: Trauma-Sensitive Yoga and Resiliency Training to Benefit First Responders and Emergency Personnel” on February 4 – 6, 2015 in Sedona, AZ. Scientific studies now show that yoga and other mindfulness practices have a significant positive contribution on alleviating PTS and STS symptoms, and on strengthening body and mind resiliency. Students will leave this trauma-sensitive yoga training with the necessary tools to benefit this population. Certified yoga teachers are eligible to receive 14 CEUs through Yoga Alliance through the training, while nurses and counselors can receive 22 CEUs. Last year, the Sedona Yoga Festival helped the Give Back Yoga Foundation to reach their goal of getting therapeutic yoga toolkits into the hands of 10,000 Veterans. Through the 2015 SYF Gives Back training, the organizations collaboratively aim to share skills and tools to help bring therapeutic yoga to at least 4,000 first responders nationwide. The Trauma-Sensitive Yoga and Resiliency Training to Benefit First Responders is the first offering of a new program called Yoga for First Responders, sponsored through the Give Back Yoga Foundation. The Yoga for First Responders program and upcoming training are led by Olivia Kvitne, ERYT-500, who is also an Assistant Editor of LA Yoga Magazine. Olivia has taught regular yoga classes and continuing education for the Los Angeles Fire Department, as well as specialty workshops on trauma-sensitive yoga for high-ranking command staff of the Los Angeles Police Department. Download the training flyer to print and share. Another fellow faculty member, Bhava Ram, ERYT-500 — aka Brad Willis — is a former award-winning network news war correspondent whose career was ended by a broken back. After a subsequent diagnosis of terminal cancer, he embraced mind/body/spirit medicine and the deeper sciences of Yoga and Ayurveda, through which he ultimately healed against all odds. As a yoga teacher, he now shares the message that we all have the inner power to heal. 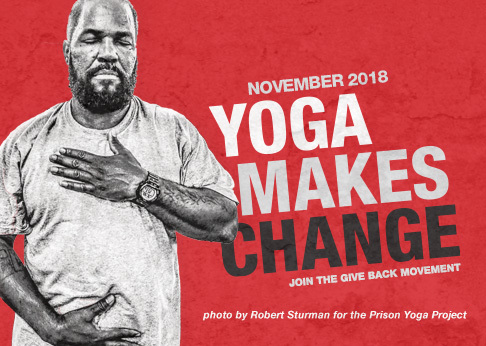 “As one who was on the front lines of conflicts and crises in Iraq, Afghanistan, Africa and Central America, I can attest to the fact that yoga gave me the strength to lift myself out of an abyss of profound physical and mental anguish, and ultimately find new meaning and purpose in life,” says Ram. Learn more about the Trauma-Sensitive Yoga and Resiliency Training to Benefit First Responders and Emergency Personnel. Visit PRWeb to view the original version of this press release, supported through the web marketing team at Ramblin Jackson. We extend our thanks to Ramblin Jackson for supporting Give Back Yoga as a nonprofit organization.